Our first encounter with Wadada Leo Smith's graphic scores and compositional/improvisational language was at an Improv:21 lecture/performance hosted by ROVA Saxophone Quartet in San Francisco in 2007. In his talk, "The Systemic Language of Music & the Spirituality of Art," Smith described, in mostly poetic terms, the underpinnings of his Ankhrasmation notational language, and laid out a series of mysterious drawings across the floor in front of him, each one printed on a letter-sized piece of paper. With his characteristic slouch, trumpet pointed at the floor, he walked around the score, interacting with it as he played a solo set. Afterwards he explained some of the symbolic references of the notations, and also showed us how the different score images could be reconfigured and recombined in the moment. duo B. was very new as an ensemble at that point, and we were incredibly energized by Smith's approach, vision and conception. We contacted him the next day to ask about the music, and he express mailed us copies of that score, Luminous Axis, the same week. The two of us have been developing an approach to interpreting and embodying this music, on and off, across all the intervening years. Without the benefit of working with Smith directly as students or collaborators, we had to chart our own path through the shapes, loops, curves and colors of the piece, hoping that this serious immersion in his work would get us to a place he might have approved of, or at least one that he may have found compelling. 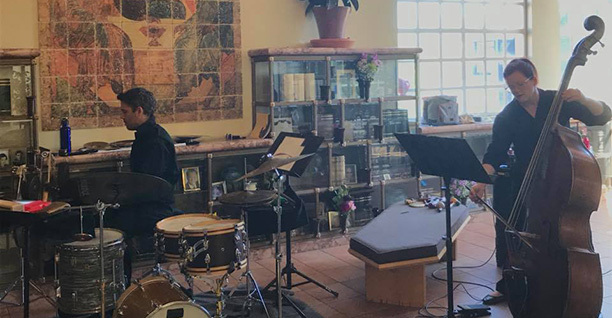 We finally played a complete version of Luminous Axis in June 2018 at the Chapel of the Chimes Garden of Memory eventin Oakland, CA, in a 4-hour continuous performance. That was an epiphany, and our research into Smith's musical world — through his writings, interviews and recordings — has been so fruitful to our growth as an ensemble, continuing to guide us with new revelations and discoveries. In fall of 2015, the duo embarked on a journey inspired by Jason's phD thesis research into free jazz compositional approaches...since then, we have been transcribing, notating, playing along with, de- and re-constructing, arranging, and in all kinds of ways trying to inhabit the musical mind of master improviser, pianist Cecil Taylor. We have been performing (attempting to perform?) 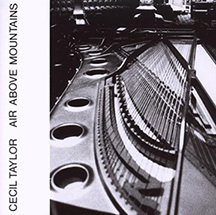 a drums and bass duo version of his 1976 live solo performance Air Above Mountains (Buildings Within), and it has been a great gift to be able to get so close to this music, this artist's process, his extraordinary focus and singular vision. It often feels like the deeper we go, the possibility of capturing this music moves farther and farther away from us; the more time we spend in Mr Taylor's sounds and structures, the more he fills us with mystery and wonder, eluding clear paths to fully grasping him.